Basically, Salon is lying, repeatedly, about what Douthat is saying so that they have an excuse to yell at him and make people on the left feel good superiority. Damn Brad, what are you reading? 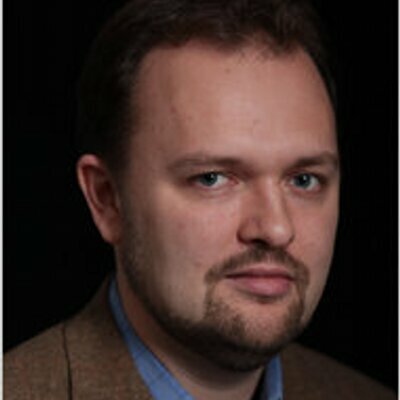 Douthat is most assuredly embracing Miller by even suggesting he belongs at a table discussing immigration. It’s an irresponsible thing to write. Salon is not lying they are just pointing out what should be obvious. Again, this is very disheartening that the NYT employees opinion writers like this. If that sentence makes sense, then words have no meaning. Do you think the only people at the table should be people whose ideas and motivations you admire? What Douthat said is quite clear: Miller’s point of view represents about a third of the country. For a decade or two now we’ve been trying to pass reform by leaving those people out. And you know what that’s led to? Zero reform, plus anger building up in that third of the population, anger so extreme that they elected Donald Trump president. So he’s saying maybe that’s not a winning strategy. Bigots don’t belong at a table with people who are attempting to resolve an important issue that involves a racial component. Miller is a bigot. Douthat suggests this bigot be a part of a discussion that has a racial component. Miller can add nothing but the bigots point of view. Therefore Douthat is embracing a bigot. This cannot be resolved with bigots at the table. However, I have to concede that elections have consequences. So this embracing bigots approach may come to pass. And the nation loses as a result. So, if you’d been with Chamberlain at Munich doing everything you could to negotiate peace with Hitler, would it be accurate to say you were embracing Hitler? Do you also think that Police officers should not try to talk down belligerent people first before using force – should they just shoot first? Talking to difficult people is not embracing them or condoning their actions. It’s just acknowledging that they have to be dealt with – because otherwise they will continue to cause problems. Talking to them does not mean you are choosing to appease or give in to them. But nothing can happen without communication. Many of those jerks sit in Congress. So they’re ALREADY part of the discussion. One of my neighbors just can’t stand it that many companies offer a Spanish-language option to folks calling in for services. Why? Well, just because, apparently. In other words, it’s irrational. Voting for Trump was, in many, many cases, equally irrational. Let’s not try and make irrational thinking socially acceptable just for the sake of an artificial decorum. Sometimes you simply have to make someone aware of how wrong they are. Something I’ve largely committed my life to doing (hence this post, for instance, meant to pop the bubble of some folks who are SURE they’re right). I guess I accept that this is happening in a lot of cases, but I still find it perplexing. I don’t feel that tribal connections keep me from seeing something that is true. But I suppose we would be blind to our own biases and It could be happening. But I also am aware of people who hold contrary irrational views who are in “my tribe” and that doesn’t seem to matter to them. However, I have not tried invoking a tribal connection in the moment when trying to convince someone, which I think is what this video is suggesting may work. Perhaps that would help. That video isn’t all that helpful. It’s headlined, “Why Facts Don’t Convince People (and what you can do about it).” But the “what you can do about it” part is weak. It suggests such things as try to identify with the other person in some way, and then consider the possibility that you might be wrong. Also, the evolutionary explanation it gives makes me wonder why my genes have survived this long. I tend not to follow that safe path. Although I may avoid bringing up a subject to avoid conflict, I’m not going to agree with something stupid just to get along. Which suggests that I’m a mutation resulting from an anomaly in history. I agree with you Brad on this one. He clearly isn’t embracing Miller. I have made it a policy not to engage in discussion and debate with people who call me a bigot. There’s no point. The thing is, I am open to changing my mind when presented with facts and logic. I really am. But if you call me a bigot, I don’t care what else you have to say, in part because I know that you aren’t willing to listen to my side…. Having worked as a conservative in a highly liberal environment — newspaper journalism — taught me a lot. One of the things it taught me was about the extreme lack of self-awareness among many liberals…. Of course, I wouldn’t put it in such black-and-white terms. First, I’m not a “conservative.” I’m just not a liberal. And unlike most journalists, I think hard about issues and about what my position on those issues should be. Straight-news journalists work hard every day producing copy in which their own opinions are not supposed to play a part. Consequently, they approach a news story differently from the way most people do. They don’t even allow themselves to think, “What do I think about this?” They’re too proud of not having an opinion. Consequently, they don’t do the hard thinking about the issue that is necessary for an intellectually honest person to arrive at a carefully-considered opinion. As a result of that lack of reflection, they’re own unconscious political views (which they have, whether they think they do or not) never develop beyond where they were the last time they allowed themselves to have opinions — when they were in college. Politically, they are — in their semiconscious way — trapped in late adolescence. And college students tended to be what we popularly call “liberal.” At least, the ones who became journalists — students of history, political science, philosophy, English and such — did. I don’t know what business or engineering students thought about things, because I didn’t interact much with them. I was rescued from this to a great extent by switching from news to editorial in mid-career. Once I had to write what I thought each day for hundreds of thousands of people to read, I started thinking really hard about what I did indeed believe. And I discovered that I had some unexamined, half-formed views that didn’t stand up to careful examination. (I’m trying to think of an example, but I’m not recalling — I just remember being startled to watch this process happening. It’s not so much that my views changed from black to white on issue after issue, but more a case of my realizing that my previous views were far too shallow.) It was about this time that I realized how many of my former colleagues were stuck in college-sophomore mode. A digression… totally apart from political views, I began to notice that regardless of their own, personal, half-formed views, straight-news journalists tended to approach stories in ways that were unhelpful to the mission of helping the public be informed, thoughtful voters. Time and again, I’d start to read a story about some issue that I realized I needed to make an editorial judgment about, and would experience this sequence of events: In reading the headline and the lede and maybe the next graf or so, I would see that there was one important question that I needed to have answered in order to know what I thought about the issue. And time and time again, I’d read to the end of the story and never get an answer to that question. You know why? Because the reporter (and his lame editor) never asked the question himself. He didn’t wonder about that point, for the simple fact that HE wasn’t trying to make up his mind what to think about it — what editorial point he wished to embrace. Consequently, by failing to think of that critical question, he was failing the reader, who depended on news reports to help him, as a voter, form informed opinions. I had always thought I was a pretty smart guy back in my newsroom editing days. But I realized after making the move to editorial in 1994 that I had never really thought deeply enough about issues until I had to have opinions about them. Not really a lot of difference between Richard Spencer and STEPHEN MILLER. That would be the appropriate comparison. So why not have Spencer on the immigration committee? Would make as much sense. A dollop more Know-Nothingism won’t do the trick when it comes to immigration. Way back in 1715, the colony of South Carolina passed a statute that prohibited entry by “native Irish and other persons of known poor character or Roman Catholics.” So nativism has been with us from the beginning and throughout our history. Many folks already here don’t want others horning in on the good thing they’ve got going, so they invent categories of “undesirables.” The only thing that’s changed is the label and which group of people it’s being slapped onto. In that sense, then, it’s only right and proper to call bigotry by its name. That was 7 years ago. This has probably only gotten worse. I would maintain these so-called “conservatives” feel vulnerable because either (a) they really are racist and don’t won’t to acknowledge it or (b) they are extremely thin skinned. If you really aren’t a racist you should have nothing to dread. Perhaps the most oppressed group of people today is the atheist/agnostic community. Just try to deny the existence of god whenever you have a gathering and everyone starts to give thanks before a meal. Should an atheist be allowed to sit on a committee addressing issues of religious tolerance? Of course. But the difference between an atheist and a racist is the atheist is willing to tolerate believers. They just want to be free of the oppression served up by religious people, i.e., praying in public. The racist wants to suppress people of color. Again I ask, why would having a racist on a panel dealing with race advance the cause of immigration in a positive direction? Yes, Bud, that’s a rather silly assertion. While atheism isn’t quite on the march the way it was, say, 10 years ago — I think the loss of Christopher Hitchens‘ wit momentarily spilled some of the wind from its sails — it has a firm hold, and in many circles is the only acceptable stance. …and has developed an antitheist philosophy as he has aged. He has stated that he believes religion will eventually be as widely condemned as racism. In certain circles, you can see that happening today. In his case, it doesn’t keep him from being funny. Perhaps it even helps. Why on Earth would you? Talk about bad manners. Why not, while you’re at it, make fun of the appearance of your hostess? Or make nasty remarks about the food that is served? Who in the world starts an argument about fundamental beliefs at a social gathering? We’re not talking belief systems with that kind of behavior. We’re talking poor breeding. State law REQUIRES a belief in God to hold political office. It does not require one to be male, heterosexual, white, a property owner, of European descent, educated, Christian or able bodied. But you DO have to believe in God. That pretty oppressed. Yeah, but it’s an unenforceable law. How do you know someone isn’t lying when he professes belief? Brad you live in a world where belief in God is the normal way of things. But imagine if you lived in world occupied by atheists and agnostics who argued about whether or not God even existed but scoff at the very notion some specific God is real. But you are a Christian (or Jew or Muslim) who is held in the lowest regard by the vast majority. Then imagine you have dinner with a group of atheists and agnostics and they have these rituals regarding non-belief. They have “God is imaginary” printed on your money. Then you have dinner and rather than saying grace they proclaim the non-existence of God. Then you go to a sporting event and 70,000 people bow to similar proclamations of non-existence before the alma matter is sung. Imagine such a world and that’s the world faced by the atheist. It’s a pretty lonely and oppressive world to live in even if there isn’t open hostility. I would find it very tiresome. Sort of the way I often find the real world. Do you really think I don’t know what it’s like to live in a world filled with, and dominated by, people who don’t see things the way I do? How do you think I feel about living in a world in which people act as though football is their religion (and they do, and I think it’s bizarre), and just WILL NOT stop going on about it? How about being surrounded by people who think one HAS TO be either a Democrat or a Republican, of the left or of the right? Worse than that, since I don’t agree with THEM, they assume I’m the opposite thing. So I spend a good bit of time with everyone ticked off at me — and you know how seriously people take their polarization these days. I don’t want to play, but people insist on pulling me into their stupid game anyway. Then there’s the matter of growing up surrounded by kids who never shut up about how amazingly awesome things like ice cream and cake and cookies were, and how they couldn’t live without them, knowing that I would live my whole life without them? You have no idea how maddening that was. What do you think it’s like being opposed to abortion, and seldom encountering anyone in your work life who agrees with you on that fundamental point, instead being surrounded by people who maintain you “hate women” because you care about the most vulnerable life among us? Oh, and before you scoff at such “trivial” things as being allergic to ice cream (and bread, and milk, and pizza, and most things people in our culture take for granted) — it is VERY alienating to grow up not even being able to eat the same foods as everyone else. It makes you feel kind of like you’re from another planet, which I’ve often joked about. None of these things are big deals, and I don’t feel sorry for myself for any of them. I pretty much shrug them off. It just bugs me sometimes the way often well-meaning people think I’m some kind of Mr. Average who never feels ill-at-ease in the dominant culture, a guy who’s never known alienation or had people misunderstand him, some self-satisfied member of the overwhelming majority who needs to “check his privilege” before opening his mouth. So I thought I’d point out some of the ways that not that at all. In fact, I’ve spent a good bit of my life being the weirdo in the room… as I suspect most people have in one way or another. Nobody has a monopoly on being ostracized or made to feel different. So I don’t really need to have it explained in terms of a hypothetical. Sorry to unload on you there. Here’s one of the weirdest things for me… Because I hold many traditional, mainstream ideas — patriotism, a belief in American exceptionalism, for instance — some of my friends try, oh, so gently, to explain to me that there’s a wide world out there beyond my sheltered little existence, and that people in other countries might not see it the way I do, and if only I’d broaden my view a bit. And it doesn’t occur to them that maybe I HAVE a pretty broad view, fairly cosmopolitan even (in time as well as space — I think one of the worst chauvinisms of the human mind is the one that’s stuck in today’s modes of thought) — and that in the end I’ve examined all the moral-relativism arguments and ended up concluding that you know what? This IS a pretty noble experiment we’ve got going here, and it has a great deal to offer the world, once you consider all the alternatives, and that our system’s warts are in the end just warts, and not fatal flaws, considered against the grand backdrop of blood-drenched history. So to the “sophisticated” I may sound like a simpleton, but I’ve actually looked at what they look at, and at other things as well, and realized that as unfashionable as such a conclusion may be in some quarters, the flag-wavers actually do have a point. They might not even understand why they’re right; it may be pure prejudice born of narrow experience — chauvinism, as I say — but the country they’re so blindly loyal to actually stands up quite well to critical, broadly considered examination. But try explaining that to people stuck in that stage of sophomore discovery that everyone goes through in late adolescence: Now I see it! The scales have fallen from my eyes! Our way isn’t perfect! I figure there’s a reason why my ancestors left Scandinavia more than 1,000 years ago. OK, so I know why — they left to take Normandy away from the French. Then they left Normandy to take England away from the Saxons. Then they came here to take this country away from the Indians. Syed Rizwan Farook (June 14, 1987– December 2, 2015) and Tashfeen Malik (July 13, 1986 – December 2, 2015) were the two perpetrators of a terrorist attack at the Inland Regional Center in San Bernardino, California, on December 2, 2015. In the attack, they killed 14 people and injured 22 others. Both died in a shootout with police later that same day. Let’s just assume that the Salon article is an example of “left-leaning irrationality.” It is simply an example and doesn’t characterize the left. Lefties have their wingnuts. So does the right. One group’s nonsensical diatribes doesn’t define the whole of which they are a part. This post sounds like another of Brad’s attempts at false equivalencies. Overstated opinion just doesn’t equate to outright lies and disinformation. On the Miller inclusion, his presence at the table reminds me of President Trump’s favorite “deal-making” tool – start from the outrageous, settle for what you wanted originally, and say you’ve compromised. Miller represents the worst of the nativist (and other labels) side to the issues of immigration. The legalization of Dreamers is the central issue, supported by big majorities (even Republicans). In order to establish that one goal, the Dreamer supporters are expected to accept things like long waits for citizenship, ending compassionate immigration, severely restricting family sponsorship, cuts in immigration numbers, and call it compromise. What kind of compromise are the Democrats offering? Is it wrong for Trump to expect SOMETHING from his list of demands? Schumer said he’d go for building the wall. That gets the Dreamers what they want. Start with that and then the rest just becomes a numbers game to hash out. But, much like the Obama days with Republicans, Democrats are now in the position of not wanting to give Trump anything that would help him with his supporters. It’s more about 2018 mid year elections than doing what is right. Dang! This post was supposed to bury the whole “false equivalence” meme for good! Didn’t you get the memo? Actually, the Salon piece — especially the headline and subhed — ARE examples of lying and disinformation. And yeah, sure: There are plenty of liberals who don’t do this, just as there are plenty of conservatives who don’t act like Trump (and who despise him, if they’re real conservatives). Interesting that you still have yet to put up anything on the State of the Union address. In Obama years you were doing live Tweets and couldn’t praise the man enough. Trump gets in and gives the SOTU address which was one of the best I’ve ever listened to. It was so good that even the liberal media outlet I was watching got to the point where they stopped panning the sour puss of the Democrats… especially Pelosi and seemed to increase the volume on the Democratic cough strategy. Word was CNN even commented on both. One of the highlights of the evening was at the very end… Nancy Pelosi ran out of the chambers like that bad burrito she had for lunch had suddenly kicked in and the sulking CBC in their native garb wasn’t far behind her. And what was that pathetic speech Kennedy gave? He spoke like a high school debate participant in an Obama cadence, threw in speaking in a foreign language like great-uncle John, and slobbered like drunk great-uncle Teddy. The only reason I can see he’s even in office is because of his last name. I did the live Tweets. Go look at them. One of them got 59 likes, 12 retweets and five replies. Although it wasn’t really my personal favorite. I thought about posting a bunch of them here, but I’ve gotten the impression that doesn’t interest y’all much. Oh, and your memory is faulty. I said plenty of critical things about Obama. But were my comments more positive? You bet! How could it be otherwise? Barack Obama is an intelligent, dignified man who was worthy of the office, however many times I may have disagreed with him. Donald Trump is a disgrace to the presidency, as he reminds us daily. Daily? What has he done recently? Did you compare your paycheck this month to last month? Notice a difference (I did)? You can always donate your tax cut to charity if it offends you. Brad’s been disgusted since Trump was elected… nothing will change during these next seven years. I wonder if Ivana will be old enough to run in 2024? Maybe she can run against Chelsea. Why did you suddenly change the subject? I mean, right after your second paragraph? I haven’t looked at a paycheck in years, and don’t intend to start now. And if I did, I cannot even begin to imagine what it would have to do with Trump being a disgrace, which he is. And Doug, how many times do we have to go around and around, and make me go draw up a list for you, because you are in the minority of people in this country who doesn’t see, every day, the ways that Trump drags down the presidency? I think the last time we did this, Trump had just returned from a foreign trip, on which you thought he did the nation credit, and you demanded to know in what ways he had not, so I gave you six or seven strong examples. It’s tiresome. The simplest way to do this, of course, would be for you to run look at his Twitter feed. You won’t necessarily see the worst stuff, but you’ll get a nice sampling, and it will more than prove my point. As to the rest of your response, don’t you realize that if you have to keep repeating yourself and making yourself appear right… that you’re probably wrong? Maybe you’re just politically smarter than the rest of us. You’re bizarre. You don’t even see what you’re doing. I changed the subject only to provide some balance to your hyperbole about Trump. No matter what he does from this day forward, including if he signs a deal that helps Dreamers, you have to keep the constant drumbeat of over the top rhetoric. The tax cuts were an accomplishment. People across the country will connect them to Trump. His approval rating is around 45% . Here’s not Richard Nixon. Hes not Gerald Ford. So far I’d give him a C+ for the first year… Too many staff changes but no major policy issues other than keeping the Bush and Obama wars going. . The media that hates him has just gone loco. You don’t like the way he talks. We get it. He’s somehow overcome that liability to become a billionaire President. I understand money means nothing to you. In that regard, you are an extreme outlier. Most people have a clue about how much they are paid and would notice if they got a couple hundred bucks more each month… Which I’m guessing you are. His average approval rating as per RealClear is 40% not 45, lower at 538. So lat least get your facts right. Does that really make a difference when trying to call him the worst President ever? Here’s not even in the top 3 worst of my lifetime yet. 40% when the unemployment rate is @ 4.1% is stunning. It takes an exceptionally awful human being to “accomplish” that level of infamy. Trump is that bad. Doug I think you realize that but just enjoy pushing Brad’s buttons. Oh, yes he is. Before him, I used to vote for Andrew Jackson as worst. Good cases could also be made for Buchanan and Andrew Johnson. But all those people had more of a clue, and better characters, than this guy. But then I saw he was addressing his fellow conservatives who keep trying to rationalize and normalize Trump, who keep saying, “Well, HERE’S a good thing he did” — according to their ideological lights, of course. Mine went up a whopping $5. It went toward the extra money I spent for gas. Thank you Mr. Trump for the high gas prices and surging interest rates. I’d be happy to give that back so we don’t pollut our environment, deport dreamers, demean Muslims, send troops to Afghanistan, send new combatants to Gitmo, kill civilians in Syria, increase our trade deficit and generally bring disgrace and ridicule from the rest of the world. Believe it or not Doug some things really are more important than money. Aren’t you retired? Tax cuts go to people who have jobs. I’m still paying half my salary to taxes across federal, state, and local. That’s plenty. Don’t worry Doug. Before Trump finishes screwing things up I’m sure I’ll be working again. I some you were blaming Obama when gas was $4? Yeah, the President sets the price. That’s how it works. You don’t get to cherry pick statistics in order to make your point. It’s all or nothing. Ummm, you could just look to Melania for her views on her husband. Personally, trolling Trump in a Hillary pantsuit last night was a classic exclamation of the error of our election choice. Trump may have pulled off his best moment last night, but that in no way counter-balances his routine disgracing – yes, disgracing – of the office of President of the United States. And Doug, it isn’t a tax cut if it adds more than a trillion to the deficit. Well, it may be a cut to you, but not to your kids and grandkids. The “tax cut” was just a mugging of future generations. That should make you bristle, I would have thought. No different than TARP. So NOW we’re concerned about the debt? I’ve always been concerned about the debt. But a rational person becomes far LESS concerned in times when debt is called for — in wartime, or a severe economic crisis (depression or bad recession). In times such as those you raise debt through emergency spending, and resolve to bring it back down when the crisis is over. Running up debt at an even faster rate at a time when the economy is growing and you’re not in an existential war is nuts…. 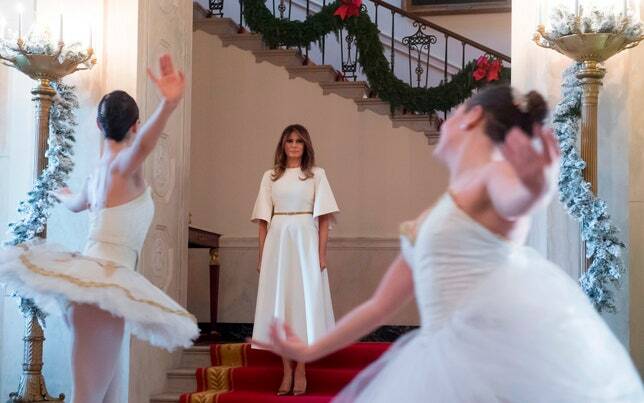 Melania could wear a flour sack and make it look classy. It helps when you have legs up to your armpits and your measurements aren’t all the same number. We don’t need to get off on a tangent on this, but it’s an interesting minor side phenomenon — Trump supporters largely think Melania is the height of female attractiveness. That impassive mask of a face, showing no thought or emotion, that stance that makes you think of those Barbie dolls that have a rod going up their backs to hold them up — they think THIS is what a woman should be like. Which won’t make a bit of sense to Claus, I’m sure…. Oh, you mean the money Treasury is borrowing to give a tax break to people and corporations so that Republicans can claim to have given a benefit? Watch what happens to interest rates on Treasuries on top of the Fed rate actions. This is short-term candy aimed at fueling an attack on Social Security, Medicare, and Medicaid because of rising debt – caused by the usual suspects.. I saw Short-Term Candy open up for the Gin Blossoms at the Township in 1999. The money going back into people’s pocketbooks will be spent.. that generates more jobs and more taxes. Until someone is serious about cutting spending, I’ll gladly take 2% back (while still giving 22%) from the federal government. Better for me to have that the government to waste it. And the big spenders will be your friends the Koch Brothers (they’ve already started) and their allies in buying lawmakers. Upper income people will buy a lot of stocks, driving up stock prices further sensible price/earnings ratios. Companies will buy companies, not start them, just as they have done since the Bush 2 tax cuts. Demand may cause the FED to raise interest rates beyond their planned ramp-up. Added Federal borrowing will push up bond interest rates which will dampen stock prices and increase the likelihood of a “correction.” The money put in middle-income folks’ pockets will be spent on goods and services. The money the wealthiest keep will be spent on investments, buying politicians, and a few goods and services. Lower income people spend almost all of what they have. Top income people don’t spend nearly as much for their needs. They invest to preserve their wealth. I haven’t checked lately but P/Es must be sky high. Can’t be sustained forever. From Robert Samuelson’s January 29 article: “Since 1936, the median price-earnings ratio for the Standard & Poor’s 500 stock index is 17; the present P/E is about 24, says Howard Silverblatt of S&P Dow Jones Indices. What goes up, must come down. But how far, and when? People buy stocks because they believe they will be more valuable later. That’s how it works. Whatever the Koch brothers spend, it’s their right to do so. Same for George Soros and labor union’s. If they want to waste their money, they can. Do they? Because a lot of people don’t act like it. Seems too many people get excited about buying when the market’s up, and want to dump stocks when they’re down…. ‘Cept the Koch brothers spend theirs trying to increase their own power and wealth. Not so for Soros, and the unions aim at empowering more people. In addition, the Kochs and allies have a neat way to get you to pay part of their political spending. It’s called 501c, educational and charitable corporations. They build fake large and small fake grass-roots groups that carry their message and deduct the “charitable” donations from their taxable income. You and other taxpayers, in effect, subsidize them. Move-on.org (Soros, et al), OFA, and most other left-leaning groups have never even applied for that tax-exempt status. Inflated stock prices, more earnings for wealthier folks, and more companies buying other companies (mergers and acquisitions). Not much job creation. … which, of course, is all government does. Which is what kind of tosses Doug’s argument out the window — he believes that. You understand the difference between wasting my money and taking yours and wasting it, right? Actually, I don’t think you do (sadly). I don’t have the power to tax to raise more to waste. I’m accountable. Good thing you don’t have the power to tax, since all you tell me you’d do with it is waste it. I’m not on Twitter, I don’t need to know what someone is eating for lunch or that some bird pooped on their freshly washed car. I’m just not that interested in people’s immediate life events. I bet Brad sat through the speech looking like Nancy Pelosi’s long lost twin brother. OK, so… why’d you bring it up? Why? What does Twitter have to do with anything? Why didn’t you write about the State of the Union Address like you have for the past several years? Was your popular story about Henry McMaster’s Superbowl request more pressing? It was certainly more interesting to me…. I didn’t watch the speech or really pay attention to what he said. State of the Union speeches are a waste of time. A laundry list of things POTUS wants that he won’t get. I did go read your live tweets just now and I’m not sure what to make of them. There’s no context, no idea what you are referring to unless someone happened to be on Twitter while watching concurrently. You went in disgusted and stayed that way. So what’s your take on the Democrat’s response? Putting a Kennedy in front of a wrecked car was… ironic. I missed it. As Trump was finishing, Corey Hutchins distracted me with the latest craziness from Catherine Templeton, so I started reacting to that through several Twitter exchanges, and then the response was over. I did do a riff today on his name, which confuses me. In any case, I don’t set a lot of store by opposite-party responses to such speeches. The Constitution requires that the president from time to time report on the SOTU. The responses are just a product of our adversarial two-party system. Notice that I say “listen to it.” I seldom “watch” these things; I’m usually busy writing while listening. At this point Bud will give me a lecture on how much I miss by not watching TV. Not to mention that it was a Kennedy, a wrecked car, and given in a place called Fall River. There there’s the whole Chappaquiddick/Chapstick thing. That’s not a reporter, and that’s an opinion piece, not a news story. In an interview with Wired, he said that while he “was not the world’s biggest Donald Trump fan,” he would vote for him, and that Trump’s candidacy made Turning Point’s mission to “spread the conservative message in high schools and college campuses” more difficult. I guess he’s made his peace with him. It’s scary how people cannot differentiate reporting from opinion. Cable news did that to us (first, then followed by the internet); people used to understand that the editorial page was THE opinion section in a newspaper. Now, people seem to believe whatever, from wherever, as long as it meshes with their self-styled world view. It’s quite a sad devolution of a social construct. Agree wholeheartedly with you Mark. The difference between opinion pieces and actual news has become a blurred line and with propaganda coming from hard liners on both sides attempting to be presented as news, no wonder so many have difficulty making a distinction. I read the linked articles discussing the differences between liberals and conservatives and for the most part, the opinions and conclusions are on point. They confirm what I have witnessed and experienced when trying to discuss sensitive topics with both liberals and conservatives. Truth is that both are equally guilty of not listening or hearing after the other side uses one or more of the dog whistle words in an accusatory manner that evokes a Pavlovian response immediately and the conversation either abruptly ends or continues with vitriol and anger that never solves a problem or changes a perception. Did you see the news report released the other day about the pyramid found under the ocean that’s 8.5 miles x 8.5 miles in size? It was on the same page as the article about the humanzee born in China in 1920. But people are a lot more CONFUSED about it because they are influenced by cable TV “news” and they don’t understand the practical problems inherent to that medium. Those stations run “news” 24 hours a day. Well, you know what? There’s not that much news. Or maybe there is, if you define news downward (such as taking crime stories that never would have been reported outside their communities in past generations, but which now are taken national). But no news station has the resources to generate enough straight, completely and professionally reported news to fill 24 hours. So they fill the time with people offering their opinions and/or conjecture about the news. And people who mean TV when they say “the news” start to think it’s ALL supposed to be news, and then they get all worked up about the fact that it’s a bunch of opinion and total, inaccurate rot…. Enlighten me. How can ‘CONFUSED’ not be equated to a blurred line? Either way, both sides use the news to support their position on an issue and by doing so, intermingling news and opinion does blur the line and create confusion as to what is actual news and what is opinion. We’re talking about opinion vs. reporting. I thought I’d throw in fake news while we’re at it. How about newspapers just stop editorials all together… since it’s been confirmed here that all they are is an opinion and not news. I’d prefer the newspaper to pay someone to report actual news rather than give me their opinion… which has no greater value than mine or anyone else’s. “all they are is an opinion”… You make it sound like opinion is somehow less than news. It’s the other way around. Opinion is more than news. And in a newspaper, it’s provided in addition to the news, not instead of it. You don’t seem to see that. I actually prefer to learn things through opinion writing. It gives your brain more of a workout, and makes obtaining news far more interesting. And it’s honest. No one is pretending he is a completely neutral observer. He’s telling you what he’s learned, and also what he thinks about it. … which is cowardly of them. I was responsible for the editorial position of the paper. My own views were expressed separately, in columns and in this blog. But you don’t seem to understand what an informed opinion is. From your words, you seem to think they simply arise from one’s own gut or prejudices. And perhaps with you, they do. They certainly do with Trump; the man is immune to facts. But informed opinion arises from the facts themselves. It’s the next step. It’s about what to do in light of the facts. So… give me the facts and let me determine my own opinion. It’s not like newspaper editors are experts on everything anymore than the average reader is. I don’t exactly thing Journalism schools crank out geniuses with every graduating class. How was your informed opinion on the mass transit system/economy/ncaa/retirement system/tourism/etc… any different than the average reader’s? Because I doubt you just wrote editorials on just your area of expertise. No, they don’t. It takes years and years of covering the news — years of having a level of access to events and newsmakers that 99.99 percent of people will never have, years of spending long hours every day digging into these things — to develop the kind of understanding and insight that will, in some cases (not everyone is cut out for it), prepare you for an editorial position. I don’t think I’ve ever considered anyone with less than 10 years experience for an editorial board position. But there’s really not much point in our discussing this. You support Donald Trump, which means you don’t believe in expertise. It’s like talking to Doug. He think that the less experience you have, the better — in politics, anyway. As long as someone believes that, there’s no way he or she will ever get what I’m talking about here…. Since Doug gave Trump a C+ I’ll take that as an invitation to render a grade. He deserves some credit for not screwing up the Obama recovery. Also, he hasn’t overtly lied us into war, although he is quietly putting more troops into the ME. But beyond that he’s been horrendous. His handling of Puerto Rico was terrible. The environment is under assault. Violent crime, especially hate crime is on the rise. Interest rates and gasoline prices are rising. His dismantelling the ACA will result in more sickness and shorter lives. Worst of all he’s made us a laughing stock to the rest of the world. His constant tweet mastering is both irresponsible and juvenile. I am scared that he’s going to go too far one day. All in all there has been just enough right to keep him out of George W Bush territory. Still, I can give him no better than a D-. He deserves no credit for not having “overtly lied us into war,” since none of his predecessors did so, either. Oh, wait: Are you dredging up the doubt about who really sank the Maine? Trump’s first year was better (in my opinion) than any of George W’s eight. I’m not sure he would beat Trump in an IQ contest and his record related to the phony war on terror was unforgivable. Trumps first year was certainly better than W’s first year. And that was before he lied us into war. 9-11 pretty much gave W the loss. We are still living in the time “before he lied us into war.” Because he never did such a thing. I worry about you and Doug; I really do. A lot of folks once thought BDS was an eight-year disease. Apparently, the sufferers never recover. There has never, in our entire history, been a president within light years of being as grossly unfit as Donald Trump. Not even for one second. It’s a ones and zeroes thing. There’s everybody else, then there’s Trump. Yesterday, I referred y’all to a piece from the end of December by conservative columnist Bret Stephens that explained this. Trump is succeeding in this. He is having his way, for all the investigative vigor of the free press he derides, for all the honor of the judiciary that has pushed back against his attempts to stain with bigotry the law of the land. Slowly but surely, the president is getting people to shrug…. And there it is, the horrible thing that happens. You warn Doug of the problem, and he shrugs. And in your comment above, so do you, Bud. Bud, I know you like to demonize all Republicans, and Doug is unimpressed by our republic and what it has stood for. But everyone really needs to realize this is beyond the usual partisan games. This is a crisis for our nation, for liberals, conservatives and moderates alike. And everybody needs to stop shrugging. NOW. Such apathy, such gross misreading of the situation, is extraordinarily dangerous. My “unimpressed” is matched by your patriotic rose colored glasses. I’m not deranged about Bush. I paid attention. I saw the innocent death counts and knew the Iraq war was a ruse when Powell did his dog and pony show for the U.N we’ve wasted trillions of dollars on useless wars. I paid attention, too, which is why I had a lot of problems with Bush (documented at the time). Same with Nixon, for instance. But they are still in the one category with all the comparatively fit people, and Trump is in the other one by himself. There has never, in our entire history, been a president within light years of being as grossly unfit as Donald Trump. I don’t disagree with that. He is completely unfit to be president. Doug and I part company on that aspect of the man. But bear with me a moment. Fitness for office is DIFFERENT from how he has performed as president. Perhaps because he doles out his presidential duties to more responsible people like Kelly and Mad Dog things have not gone totally off the rails. And they still could. I go to bed scared every night. But at the end of the day you have to judge the president’s performance by what actually happens. During W’s first year 9-11 happened. And it was largely because of his failure to act on intelligence. It’s safe to say Trump himself doesn’t look at nor understand intelligence briefings. Perhaps Trump’s people have taken on the task of looking at intelligence and acting accordingly. Perhaps his predecessors put in place measures that would alert the appropriate people before a 9-11 style attack could be implemented. Or perhaps Trump has just been lucky. But regardless of how unfit he appears his record of protecting the nation has been better than W’s during his first year. That is just a fact. Since the liberals on the board are handing out grades, I’ll throw my grade into the ring… I’ll give him a solid A, not an A+ or an A-. Once he completely eliminates everything Obama rammed through I may increase the grade to an A+. But I can see how the HIllary supporters feel, if Hillary had won no matter what she did I’d probably be giving her a D- as well. I thought Bud said it started with Doug. So do you mean “liberal” in the sense of 19th-century liberal, because he’s a libertarian? I’m ultra left on social and military issues and ultra right on government spending and taxation. Libertarian means supporting freedom and personal responsibility. I never said or implied that.. in no way is Doug like bud. Once Doug comes around to thinking the military is a good thing Doug will be more like Claus. No… you implied it. Show me where I said or implied it because I just reread t his thread and don’t see where I said or implied any of that. Show me facts, not your informed opinion. Where? That link goes to my comment about giving Trump a grade. I see you mentioning bud and Doug… can you please copy and paste my mentioning what you’re accusing me of? One of us doesn’t have a clue as to what he’s talking about… and I am pretty much convinced it’s not me. Prove me wrong. I can’t believe I just wasted time pointing out the painfully obvious. What’s the big deal? Why are you acting like we should have read that any other way but you lumping Bud and Doug together? No reasonable person would read it any other way. I can’t believe I just wasted my time reading the thread between the two of you.